Buy Two Items - Get One Free! Sometimes cardio doesn't cut it. You need to pick up those weights and get pumped. If you don't, we've got one question: "Do you even lift?" Bro, seriously, you've gotta lift. Our funny gym t-shirts and hoodies are perfect for those people who hit the weights, and let people know... and then question other people's ability to hit the weights. 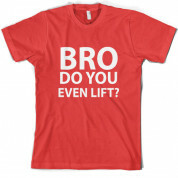 Mens Unisex T-Shirt: Our men's Do You Even Lift t shirt is printed onto our premium 190 GSM one piece crew neck t-shirt. Available in 10 Colours and from Size Small to XXL. Women's Slim fit T-shirt: Our women's Do You Even Lift t-shirt is printed on our popular 150 GSM ring spun womens garment. Available in 11 colours and from Size Small to XXL. Unisex Hoodie: Our unisex style Do You Even Lift Hooded top is printed on our 280 GSM kangaroo pocket garment and is Available in 9 Colours and with sizes Small to XXL. Not quite what you're looking for? Take a look at our huge range of funny gym t-shirts.